Sweden's capital, confident and self-assured, glitters with souvenirs from the day when it ruled as a superpower. From pondering gilded royal staterooms to sampling gourmet reindeer and sipping vodka in an ice bar, we experience the city's cultural highlights. Then we sail the archipelago for the prettiest island-hopping in northern Europe. Although Sweden's royal family beds down at Drottningholm, this complex in Gamla Stan is still the official royal residence. The palace, designed in Italian Baroque style, was completed in 1754 after a fire wiped out the previous palace. The Changing of the Guard and the awesome, can't-miss Royal Armory are the palace's highlights. A ticket to the Royal Palace includes four museums: The Royal Apartments are not much as far as palace rooms go but still worthwhile, the Royal Treasury is worth a look, the Museum of Three Crowns gets you down into the medieval cellars to learn about the more interesting earlier castle, and Gustav III's Museum of Antiquities is skippable. The chapel is nice enough (and it's free to enter). In peak season, the main Royal Palace offers a full slate of English tours covering the different sights. Since the palace is used for state functions, it's sometimes closed to tourists. The oldest museum in Sweden is both more and less than an armory. Rather than dusty piles of swords and muskets, it focuses on royal clothing: impressive ceremonial armor (never used in battle) and other fashion through the ages (including a room of kidswear), plus a fine collection of coaches. Everything is displayed under sturdy brick vaults, beautifully lit, and well-described in English. While not the finest palace interior in Europe (or even in Scandinavia), Drottningholm offers a chance to stroll through a place where a monarch still lives. If you enter, you'll see two floors of lavish rooms, where Sweden's royalty did their best to live in the style of Europe's divine monarchs. Drottingham is an easy boat or subway-plus-bus ride from downtown Stockholm. Consider approaching by water (as the royals traditionally did) and then returning by bus and subway (as a commoner). This 18th-century theater somehow survived the ages — complete with its instruments, original stage sets, and hand-operated sound-effects machines. It's one of two such theaters remaining in Europe (the other is in Český Krumlov, Czech Republic). Visit it on a guided tour, or check their schedule for the rare opportunity to see perfectly authentic operas. The church's carillon has played four times a day since 1666, when the city was full of German merchants. Sweden formally became a Lutheran country even before the northern part of Germany — making this the very first German Lutheran church. This yellow-brick church — Stockholm's oldest — dates from the 13th century, and has been the site of Sweden's royal weddings throughout the ages. Exploring the cathedral's interior, you'll find many styles, ranging from medieval to modern. This small, cozy restaurant (the name means "hide away"), tucked into a peaceful lane, has a stylish hardwood and candlelit interior, great sidewalk seating, and an open kitchen letting you in on Vladimir's artistry. If you dine well in Stockholm once (or twice), I'd do it here. It's gourmet without pretense. They serve delicious, modern Swedish cuisine with a reasonably priced three-course dinner. In the good-weather months, they serve weekend lunches; reserve ahead for dinner. The Stadshuset, still a functioning city hall, is where Stockholm's city council — hobby legislators with regular day jobs — meet in the evening once a week. One of Europe's finest public buildings, the site of the annual Nobel Prize banquet, and a favorite spot for weddings (they do two per hour on Saturday afternoons, when some parts of the complex may be closed). The 348-foot-tall City Hall tower (an elevator takes you halfway up) rewards those who make the climb with a grand city view. Everything in the Icebar is made of ice — shipped down from Sweden's far north. The bar, the glasses, even the tip jar are made of ice. While there are ice bars all over Europe now, this was the second one to open (after the Ice Hotel in Lapland). And it really is pretty cool…a steady 23°F (reservations smart). The villa and garden of Carl Milles is dramatically situated on a bluff overlooking the harbor in Stockholm's upper-class suburb of Lidingö. While the art is engaging and enjoyable, even the curators have little to say about it from an interpretive point of view — so your visit is basically without guidance. But in Milles' house, which dates from the 1920s, you can see his north-lit studio and get a sense of his creative genius. In 1548, King Gustav Vasa decided to pin his chances on this location, ordering the construction of a fortress here and literally filling in other waterways, effectively making this the only way into or out of Stockholm...which it remained for 450 years. Today, the fortress welcomes guests to wander its tough little island and visit its museum. The modern exhibit traces the military history of this fortress and of Sweden in general. It's as interesting as a museum about Swedish military history can be. Vaxholm's most tempting eatery serves "summer lunches" (salads and sandwiches) and homemade sweets, with delightful outdoor seating around the Homestead Museum in Vaxholm's characteristic fishermen's quarter. Run by Henrik, this place specializes in well-constructed, ingredient-driven dishes with local herbs and vegetables grown on the island and seafood caught by the local fishermen. The warship Vasa sank in 1628 in Stockholm's harbor on her maiden voyage, was rediscovered in 1956, raised in 1961, and since 1990 has been surrounded by a brilliant museum that brilliantly shows off its painstaking restoration (95 percent of the wood is original). Learn about the ship's rules (bread can't be older than eight years), why it sank (stale bread? ), how it's preserved (the ship, not the bread), and so on. Europe's original open-air folk museum is a huge park dotted with historic buildings from all across Sweden. In the "Old Stockholm" section, shoemakers, potters, and glassblowers are busy doing their traditional thing; the rest of Sweden spreads out from here. The old houses come alive when you take the initiative to ask the frendly guides dotted throughout the park. Hi. I'm Rick Steves, back with more of the best of Europe. This time we're in the birthplace of social security and dynamite. It's Sweden's capital city: Stockholm. Thanks for joining us. Here in the north of Europe, of the Scandinavian countries, Sweden is the biggest and most populous. And Stockholm is by far Sweden's dominant city. Locals here are considered particularly confident and self-assured. And exploring this city, the character of its people unfolds through its many attractions. 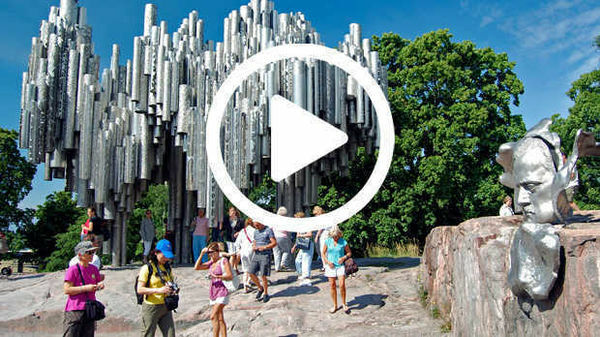 We'll explore the old town, be dazzled in its city hall, enjoy a slice of reindeer in style, cruise to the palace, chill out in a convivial ice bar, imagine Sweden's once-upon-a-time mighty navy, marvel at the work of a local sculptor, tap our toes to a Swedish beat, and sail the archipelago for the ultimate in Scandinavian summer beauty. Today, with nearly two million people in Stockholm's greater metropolitan area, one in five Swedes calls this city home. Once a respected military power, now famously neutral, this stately capital respects its rich heritage while embracing modern innovation. Stockholm is defined as much by water as it is by land. Part of an archipelago, it's surrounded by both the sea and a large lake. The city is nearly as full of parks and trees as it is with buildings, and it's traversed by numerous bridges. Wander through the city and you're struck by its elegant architecture, proud monuments, and inviting promenades. Stockholm's appealing waterfront is both a working harbor and a welcoming people zone. Overlooking it all in the heart of the old town is the Royal Palace. In summer, with great fanfare, military bands herald the Changing of the Guard. The ceremony in the courtyard of the palace recalls the days when Sweden was a militaristic power – a kingdom to be reckoned with. While this spectacle does look formidable, it's more a celebration of Swedish heritage in a country that today is famously pacifist. Strong and expansionist kings — like Gustavus Adolphus, who ruled in the early 1600s and was a brilliant general — made Stockholm this country's permanent capital and established the Swedish Empire. Gustavus Adolphus was nicknamed the "Lion of the North." He made Sweden one of Europe's top powers, and was instrumental in helping the Protestants turn the tide against the Catholics in the Thirty Years' War. Because of his innovative tactics on the battlefield, he's considered by many the "father of modern warfare." For a glimpse at the splendor of Sweden's former power, step into the Royal Armory. While fearsome on the battlefield, armor had a ceremonial value as well. These pieces must have dazzled viewers back in the 1600s — that was the point. The fine workmanship elevates tools of war to an art form. The same lavish attention to both protection and style was also given to horses. The Swedish royal family kept up with their counterparts elsewhere in Europe. Four centuries of coronation and royal wedding wear take you from the time of Gustavus Adolphus — this is his fine suit — through the ages. This 1766 wedding dress of Queen Sofia was designed to cleverly show off her fabulous wealth. And the dress — with its extravagant material — seems even wider when compared to her 20-inch corseted waist. The Royal Palace, which contains this museum and several others, is one of Europe's biggest. While it's technically the royal family's official residence, they actually live outside of town at Drottningholm Palace. The most scenic way to get there is the way the royals once did: by boat. We're cruising up Lake Maleren. This relaxing voyage is a delight, revealing more dimensions of this city of lakes, parks, and islands. Drottningholm Palace has been called "Sweden's Versailles." The public is welcome to enjoy the garden and tour the palace. The grand entry leads into a world where 18th-century style prevails. Back then, Europe's monarchs, who were considered divinely ordained to rule, were tightly networked by marriage. In fact, the Swedish royal family had blue-blooded cousins ranging from Catherine the Great in Russia to Louis XVI in France. The decor pushed the notion of a divine monarch. But the king was long challenged by a strong parliament and, today, Sweden's royalty is a modern constitutional monarchy. The ballroom hosted formal occasions. The bedroom was a kind of theater where the monarch would be ceremonially dressed as nobles would help him slip into his leotards. The lavish library illustrated the royal commitment to education in the 18th century. The palace's Baroque theater takes you back 200 years. And as in palaces throughout Europe, Roman busts implied at least symbolic connections with the Roman Empire in order to substantiate and legitimize royal power. Originally the entire city was contained on this island. Today, Stockholm's old town — or Gamla Stan — is popular with locals and visitors alike. The town square, called Stortorget, was once an important commercial center. Now, it's simply a favored place to relax and enjoy the Swedish good life. Gamla Stan's main drag is a hit with shoppers and crowded with tourists. But, venturing just a block or two from the commotion, the atmosphere changes. Tranquil lanes feel much as they did back in the 17th century. Medieval Stockholm was a trading center, busy with merchants from foreign lands. The German Church, rocketing heavenward, reminded all of the power of Germans in this part of Europe. With the Reformation in 1527, the king made Sweden a Protestant state. Suddenly church services could be held in the people's language, rather than Latin. And that meant every nationality needed its own church. The Germans worshipped over there. The Finns had their church. And the Swedes got the cathedral. The cathedral, while grand, is wedged into the tight quarters of Gamla Stan. The interior is cobbled with centuries-old tombstones. When royal families worshipped here, they sat in their own private pews. These date from about 1700. While originally Catholic, this church has been Lutheran for five centuries. With the Reformation's passion for sermons and Bible readings, the pulpit was a focal point. You can feel the feistiness of the Swedish Lutherans in this 500-year-old statue of Saint George and the Dragon. It's carved of oak and elk horn. To some, this symbolizes the Swedes overcoming their archenemies — the Danes. In a broader sense, it's an inspiration to take up the struggle against even non-Danish evil. When choosing a place for dinner, I try to leave the high-rent spots to the tourists and find small restaurants with low rent catering to a loyal hometown customers. And, of course, locals know the best places. My friend Håkan, and his wife Ylva, are taking me to one of their favorites [Kryp In] for a lesson in good eating, Swedish style. And that's changed a lot since Håkan and Ylva were children, including New World wines, and lots of spices brought by recent immigrants to enliven the traditional meat, fish, and potato staples. Rick: And what is this, Sami? Sami: This is the reindeer roast beef. Rick: Reindeer roast beef you say, OK. So, Håkan, the potato really has roots in your history and your culture? Håkan: Extremely much so. Sweden's population started to grow in the 1800s, and there was someone who said the reason was peace, vaccination, and potatoes. Rick: This reindeer is really tasty. Håkan: Oh yes, reindeer, I would say, is the beef of the north — that's the beef of the Laplanders, and it's spread all over Sweden. Local food and local knowledge, it's always a winning combination. Stockholm's Nobel Prize Museum tells the story of the world's most prestigious award. Stockholm-born Alfred Nobel was a prolific inventor with over 300 patents. His most famous invention? Dynamite. Living in the late 1800s, Nobel was a man of his age. It was a time of great optimism, wild ideas, and grand projects. His dynamite enabled entire nations to blast their way into the modern age with canals, railroads, and tunnels. It made warfare much more destructive, and it also made Alfred Noble a very wealthy man. Wanting to leave a legacy that celebrated and supported people with great ideas, he left his fortune to fund the Nobel Prize. Each year laureates are honored in the fields of physics, chemistry, medicine, literature, and perhaps most famously in peacemaking. Portraits of all the prizewinners since the first annual ceremony was held in 1901 hang from the ceiling — shuffling around the room like shirts at the dry cleaner's. And video clips let you ponder the contributions of so many great minds. The annual Nobel Prize banquet is held just a short walk away, in Stockholm's City Hall. It's a stately mix of eight million red bricks and lots of Stockholm pride. While churches dominate cities in southern Europe, up here, in the Scandinavian capitals, city halls seem to be the most impressive buildings. They celebrate humanism...people working together for the good of their community. Built in 1923, Stockholm's City Hall is particularly enjoyable, and well worth its entertaining hour-long tour. Guide: This here where we are standing is the Blue Hall. It's the biggest reception hall of the City Hall and this is where the Nobel banquet takes place the 10th of December every year, hosting 1,300 guests. This here is the Council's chamber since the City Hall really is a functioning City Hall. In here the Municipal Council of Stockholm hold their meetings. What I would like to show you in here is our magnificent ceiling. It's done to look like an old Viking house. The construction of the old Viking houses were long and narrow, exactly like the ceiling right here. This here is the Golden Hall, artwork finished in 1922. We have about 19 million pieces of mosaic in here and it is real gold in each and every one of them. The centerpiece of this room you can see behind me here, this is the Queen of the Lake, a symbol of Stockholm. The Queen of the Lake here, she is situated in the center of the world. On the left side there's the western world — the Eiffel Tower, the Statue of Liberty. On her right side the Orient — an Indian elephant, a Turkish flag. And not only the world because around her sides there are also the different zodiac signs symbolizing the universe. She's the Queen of the Lake — Stockholm — center of the world — center of the universe. The City Hall comes with a bold tower. It offers a commanding view of Stockholm's 14 islands, which are woven together by about 50 bridges. Sweden's stunning capital is green, clean, and people-friendly. Strolling the shoreline promenades, you join the parade of locals. Well-worn old working ships seem content...retired in the shadow of elegant facades. Rather than cars and buses, it's the domain of joggers, baby strollers, and visitors marveling at the joys of this city on the Baltic. Stockholm exists because of its location — where Lake Malaren meets the Baltic Sea. Traders would paddle their goods from far inland to this point, from where seagoing merchants would ship it south to Europe. In the 13th century, the new kingdom of Sweden needed revenue, so they established customs laws and levied duties on all the copper, iron, and furs that passed through here. Today, the lake, which is about two feet above sea level, is connected to the Baltic Sea by locks. For the thoughtful observer, history is everywhere. For example, centuries ago, this Kungsgården, or "King's Garden Square," was the private garden of the king. Today, this is clearly the people's domain. It's considered Stockholm's living room. Swedes are leaders among Europeans with their social legislation. They pay high taxes and have high expectations. Swedes enjoy a minimum of five weeks' paid vacation from the day they're hired. In the interest of family values, new moms and dads split 16 months of paid parental leave anyway they like. And Swedes believe that every citizen, regardless of their family's economic status, gets quality health care and education. Alcohol is highly taxed, and tourists contribute to Sweden's costly entitlements every time they buy a drink. A fun if touristy way to do that is to put on a heavy coat and enjoy a fancy vodka on ice...literally. The Absolut Icebar [now the "Icebar Stockholm"] is actually made out of ice. For your cover charge you'll get 45 chilly minutes to sip your choice of vodka drinks in an ice glass, at an ice bar, or lounging on a nice ice sofa. In a scene like this, there's no shortage of conversation. Sergels Torg was built in the 1960s to balance the political and royal city with a bustling commercial district. This modern center of Stockholm is dedicated to shopping. Festooned with sales banners blowing in the Nordic wind, thriving pedestrian boulevards are lined with temptations on sale. Hötorget — literally "Hay Market" — now feeds people rather than horses. This vibrant outdoor produce market changes colors with the seasons. Today, in August, it's berries of the forest and golden chanterelles. Overlooking the market is a striking statue by Carl Milles. For more of his work, you'll find a veritable forest of statues by Sweden's greatest sculptor on a bluff at the edge of town. Carl Milles spent much of his career here at his villa, where he lived and worked for 20 years. He lovingly designed this delightful sculpture garden. Milles wanted his art displayed on pedestals...to be seen as if silhouettes against the sky. His subjects — often Greek myths such as Pegasus or Poseidon — stand out as if using the sky as a blank paper. Yet, unlike silhouettes, images in the sky can be enjoyed from many angles. Milles injected life into his work with water, splashing playfully. Perhaps his most famous work, Hand of God, gives an insight into Milles' belief that when the artist created he was, in a way, divinely inspired. The city's harbor is busy with ferries. And many take people into its vast archipelago — an amazing playground of literally thousands of islands stretching 80 miles from the city. There are plenty of ways to see the archipelago. Those taking the huge cruise ships that ferry travelers to Helsinki enjoy three hours of island scenery before they finally reach the open Baltic Sea. You can take a quick boat tour…or, what we're doing, catch a ferry with the locals. One of the joys of an archipelago trip is to grab a perch on the breezy sundeck with the Swedes as they enjoy their island wonderland. Ferries serve over a hundred islands. They stop at others on request...or to plop down the day's mail. Every cabin seems to have a couple of lounge chairs strategically placed to soak up the relaxing view. Your archipelago options are endless, and you don't need to own a cabin to enjoy this idyllic island escape. Our first stop is the popular destination of Vaxholm. About an hour from downtown, it has a well-preserved fortress just off its busy harborfront, as well as a quiet and charming old town mixing shops and restaurants. Today it's hard to imagine that, back when Sweden was a military power, this fort was built to secure the city from attack by sea. The ramparts remain, but they're manned not by soldiers but by sun worshippers enjoying Sweden's long summer days. My favorite lookout post? Anette's Homestead Café [Hembygdsgården Café]. For Swedes, their coffee and pastry break is a ritual – embraced with all the vigor of a constitutional right. And here, savoring life to its fullest just seems to come naturally. For an even more peaceful and remote destination, ride a couple hours past Vaxholm, and hop off in Svartsö. The little grocery provides this island community with whatever it needs. Residents stock their cabins using the island's answer to a moving van. And visitors can hop a rental bike. In moments you're out in the countryside immersed in pastoral farmland and pristine nature. Your bike ride is memorably capped with a stop at the island eatery [Svartsö Krog]. We requested the house specialty, and were overwhelmed with the bounty of the Baltic. Even if you don't leave Stockholm, you'll still likely be on the water. Scenic harbor tours are popular, and shuttle boats zip between the many islands. From downtown, it's just a quick hop to Djurgården — the "Garden Island." Four hundred years ago, Djurgården was the king's hunting ground. Now this entire lush island is Stockholm's fun center, protected as a national park. You can rent a canoe, enjoy a bike ride, munch a picnic, or just take in the harbor scene along with a good cold beer. And this island has several of the city's top museums. The Vasa Museum is my favorite maritime museum anywhere. It took several centuries, but Stockholm turned a titanic flop into one of Europe's great sightseeing attractions. The Vasa — while heralded as the ultimate warship of her day — sank, just minutes into her maiden voyage. It was 1628. The king, eager to expand the reach of his domain, launched his formidable new war ship. Laden with an extra row of cannon, she was top-heavy. A couple hundred yards from the dock, a breeze caught the sails and blew it over. The Vasa sank to the bottom of Stockholm's harbor, where it sat for over 300 years. In 1961, with the help of steel cables and huge inflatable pontoons, the Vasa rose again from the deep. Today the Vasa, the best-preserved ship of its kind, is chemically petrified and housed in a state-of-the-art museum. The Vasa is decorated with hundreds of statues — all designed to show the power of the king known as the "Lion of the North," Gustavus Adolphus. Detailed models like these show life on board and evoke the instant when the hopes and aspirations of this mighty ship and her crew were dashed. Artifacts on display humanize naval live in the 17th century. This awe-inspiring ship is a time capsule from an era when Sweden was a European power and was gearing up to expand its empire. Another great sight here on the Garden Island is the Skansen open-air folk museum. This was the first in what became a Europe-wide movement to preserve traditional architecture. Founded in 1891, Skansen is a sprawling collection of 150 historic buildings that take you back in time. These homes, churches, schoolhouses, and so on were transplanted from all corners of Sweden. Today, tourists take a virtual trip all over the country without leaving the capital, seeing wonderfully furnished old interiors and folk crafts in action. Artisans demonstrate their crafts. The potter works his magic — enthralling visitors old and young. And glass — traditionally a big industry here in Sweden — is blown. Observing peasants fiddling out on the porch takes you back to a time when people provided their own entertainment. And in a park dedicated to keeping folk traditions alive, a day at Skansen is memorably capped at a bandstand with some Swedish folk dancing. I hope you've enjoyed our visit to this quiet, content, and often overlooked corner of Europe. Traveling here, you meet a people who struck that illusive balance between the productive life and the good life. Thanks for joining us. I'm Rick Steves. Until next time, keep on travelin'. Rick: Backstage it's more, see I'm having a problem. It's actually deeper than it looks. Rick: No it's not as deep as it looks. Rick: It looks deeper than it is! Canals, railroads, and tunnels. It made mmmmilitary much more destructive. Stockholm, it's cold, it's cold!